Hemp is a tall, beautiful and gracious looking annual plant that can reach heights over twelve feet. 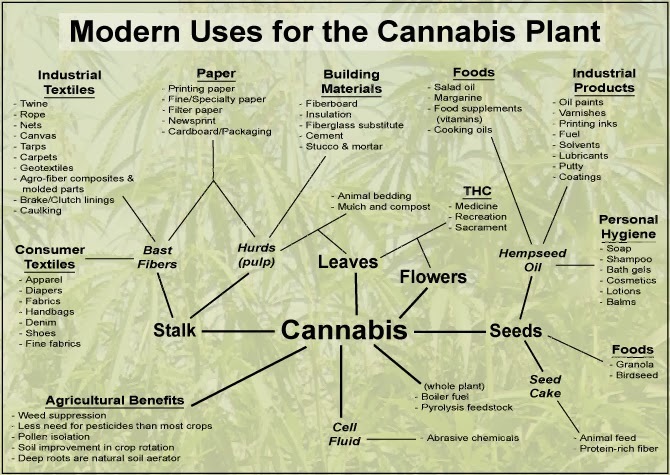 Although hemp (cannabis sativa) and marijuana (cannabis sativa var. indica) come from a similar species of plant, they are very different and confusion has been caused by deliberate misinformation with far reaching effects on socioeconomics as well as on environmental matters. Historical Use Hemp is the most universally useful plant we have at our disposal. The history of mankind’s use of hemp can be traced way back in time to between about 5000 – 7000 BC. Remains of seed husks have been found at Neolithic burial sites in central Europe, which indicate that they were used in funeral rites and shamanic ceremonies. It is probable that at that time the distinctions between various strains were not as pronounced as they are today. Up until and even during WWII, hemp was a widely grown crop, which provided the world with an excellent and most durable source of fibre. Since it is an annual with a growing cycle of only 120 days it can be harvested several times a year, depending on local weather conditions. Its biomass is considerable, which means that it absorbs large quantities of the greenhouse gas CO2. It is resistant to bugs and requires little agrochemical treatment. It is extremely undemanding and can be grown in very poor conditions and depleted soils and will actually improve the soil structure over a period of years. For many centuries hemp was one of the most important industrial crops which provided the fibres for rope and tough, durable canvass without which the age of exploration could never have set sail. In the US too, there have long been numerous rules and regulation in place regarding the cultivation of hemp. But unlike today’s regulations that strongly prohibit any cultivation of hemp, less than a century ago hemp cultivation was not just encouraged, but mandatory, with hefty fines being levied against farmers who refused. ‘Hemp for Victory’ was the government coined slogan that fuelled the last big bout of legal hemp cultivation during WWII, promoting hemp cultivation as a patriotic cause. Deliberate Misinformation About THC Hemp is a variety of cannabis sativa that has a long history of use in the United States. However, since the 1950s it has been lumped into the same category of marijuana, and thus the extremely versatile crop was doomed in the United States. Hemp is technically from the same species of plant that psychoactive marijuana comes from. However, it is from a different variety, or subspecies that contains many important differences. Industrial hemp has very low Tetrahydrocannabinol (THC) levels, which is the principal psychoactive constituent. Compared to marijuana which is specifically cultivated for personal psychoactive use, it is nearly impossible to “get high” on hemp. Marijuana that can be smoked usually contains between 5-10%t THC, industrial hemp contains about one-tenth of that. In order to get a psychoactive effect, one would need to smoke more than a dozen hemp cigarettes over a very short period of time to achieve any kind of psychoactive effect. The reason for the low THC content in hemp is that most THC is formed in resin glands on the buds and flowers of the female cannabis plant. Industrial hemp is not cultivated to produce buds, and therefore lacks the primary component that forms the marijuana high. Furthermore, industrial hemp has higher concentrations of a chemical called Cannabidiol (CBD) that has a negative effect on THC and lessens its psychoactive effects when smoked in conjunction. Industrial hemp also grows differently than THC-containing cannabis. Hemp is typically grown up, not out, because the focus is not on producing buds but on producing length of stalk. In this way, hemp is a very similar crop to bamboo. The stalk contains the fiber and hard, woody core material that can be used for a variety of purposes, even carpentry. The two also differ in the areas that they can be effectively grown. THC-producing Marijuana must be grown in generally warm and humid environments in order to produce the desired quantity and quality of THC-containing buds. However, since industrial hemp does not contain these buds, and the hardy parts of the plant are the more desired, it can be grown in a wider range of areas. Generally, industrial hemp grows best on fields that provide high yields for corn crops, which includes most of the Southwest, Southeast, and Northeast United States. Furthermore, since industrial hemp can use male plants as well as female plants (since the object is not THC production), higher crop yields can result. While there is virtually no THC in the varieties grown for industrial uses such as oil and fibre, governments have cooperated with powerful corporate lobbyists the ensure that hemp is lumped into the same category as marijuana. The primary reason is that hemp has too many abundant resources for fuel, housing, food, medicine that corporations cannot exploit. Think about how many polluting conglomerates would go down if hemp was permitted as a resource. The oil, pharmaceutical, supplement and constructions industry would need to radically shift their business model to survive. Abundant Resources Hemp provides the fibre to make a durable paper – a far more sensible solution than the wasteful method of clear cutting old growth forests, or even the cultivation pine plantations that are ecologically speaking dead zones that take 20 years to mature before they can be harvested. Cannabis produces 4 times more fibre per acre and can be harvested several times per year. The first dollar bills were printed on hemp paper, your old family bible is probably printed on hemp paper and even the constitution itself was drafted on hemp paper. Hemp has the strongest natural fibres, which can be used not just to produce rough cloth, such as sails or canvass, but also durable work clothes, like the original jeans. When the plants are grown closer together the fibre becomes shorter and finer, which allows for finer textiles. Today, there are some fashion designers that are experimenting with a wide range of textiles made from hemp for their stylish, trendy hemp lines, shirts, suits, bags, jeans and more. And, no- you can’t smoke them to get high! Hemp fibres are also finding application as a modern building material, an application that has been spearheaded and exploited successfully in France. Hemp fibres can be blended with water and limestone to create an extremely tough, light-weight, natural cement that has not only excellent insulating properties, but also shows more flexibility than conventional concrete, which makes it particularly useful as a building material in earthquake prone areas. Back in 1941, Henry Ford built a car that was not only entirely built from ‘hemp plastic’, but also ran on hemp fuel. Hemp oil, pressed from the seeds is also extremely versatile. It can be polymerized to create a solid plastic-like material, which is extremely durable, yet nevertheless is completely natural and biodegradable, which could replace plastics in numerous industrial processes. Car manufacturers are again turning to hemp as a resource to provide light-weight, yet shock absorbent and environmentally friendly material for their cars. Due to the high biomass hemp would also make an ideal source of ethanol, the best bio-fuel alternative to gasoline, which is capable of fuelling engines without producing all those evil gases that are destroying our atmosphere and poisoning the air. At long last, some of the top car manufacturers are beginning to follow in Ford’s steps. Some Facts on Hemp – Farming 6% of the continental U.S. acreage with biomass crops would provide all of America’s energy needs. – Hemp is Earth’s number-one biomass resource; it is capable of producing 10 tons per acre in four months. – Biomass can be converted to methane, methanol, or gasoline at a cost comparable to petroleum, and hemp is much better for the environment. Pyrolysis (charcoalizing), or biochemical composting are two methods of turning hemp into fuel. – Hemp can produce 10 times more methanol than corn. – Hemp fuel burns clean. Petroleum causes acid rain due to sulfur pollution. – The use of hemp fuel does not contribute to global warming. Hemp oil is of a very high quality and industry is using it in paints, inks and varnishes. In recent years the food industry is also discovering its virtues. Hempseed oil is one of the richest sources of essential amino acids and essential fatty acids, providing an excellent balance between omega-3, -6 and -9 fatty acids. All of these substances are currently being discussed, not only in the alternative health scene, but also by the food industry, which is searching for suitable ingredients to create so called ‘functional foods’. Essential fatty acids are extremely important to the proper functioning of cells. They play a role in reducing bad cholesterol and plaque, which is responsible for arteriosclerosis. Healthfood companies are beginning to experiment with hemp as a basis for a large range of products- from hemp seed bars, to gummi bears, to beer, to hemp cheese and many more. Studies have been released that show people suffering from cancer have low levels of melatonin in their bodies. Also studies have shown that just smoking hemp can raise the melatonin levels in our bodies. So one can only imagine what hemp oil that is in a concentrated state can do to increase melatonin levels. Hemp oil promotes full body healing and raises melatonin levels thousands of times higher than normal. When the pineal gland produces vast amounts of melatonin, it causes no harm to the body but it is very hard on the condition you are suffering from and indeed can eliminate it. For almost a decade, Rick Simpson has been showing people how to cure cancer with hemp oil. Both the commercial legal type of hemp oil and the illegal THC laden hemp oil are one of the most power-packed protein sources available in the plant kingdom. Its oil can be used in many nutritional and transdermal applications. In other chapters in my Winning the War on Cancer book we will discuss in-depth about GLA and cancer and also the interesting work of Dr. Johanna Budwig. She uses flax seed oil instead of hemp oil to cure cancer — through effecting changes in cell walls — using these omega3 and omega6 laden medicinal oils. Hemp Oil Uses Every application that uses petroleum for it’s skin and hair products can use hemp oil as it is more beneficial and herbal. It can be used in many health issues as either a pain reducer or even as the cure for it. – Since hemp oil is natural, it is used as a moisturizing oil which can be applied after a shower or a bath. When you massage your body with it, it nourishes the skin and increases the blood circulation. More on facial skin care. – Hemp oil is used in cooking as well, though it is not suitable for high heat cooking. Along with giving a slightly nutty and crispy taste to food, it can be the perfect salad oil just in case you’re out of olive oil. – Another application of hemp oil is it’s use as biodiesel in the same manner like other vegetable oils. It is a safe replacement for petroleum as it is non-toxic and doesn’t harm the environment. – Almost all the forms of plastics can be made by using hemp oil instead of using petroleum as a base. As those made from petroleum, release harmful chemicals while decomposition, but those from hemp oil, don’t. – Hemp oil can also be used in the production of paints as it doesn’t cause any armful releases when washed down from the drain and has very low emissions than the petroleum paints which are currently being used. – Hemp oil prevents skin disorders like psoriasis, eczema, acne and dry skin. It is highly nutritious for the skin and makes a wonderful addition to homemade moisturizing blends and rejuvenating creams. (Read Andrew Weil’s article on hemp oil) The list of beneficial uses of hemp goes on and on. So why is non-psychoactive Hemp illegal? There is an old saying: if you want to get to the root of a problem, follow the money. This holds true for hemp. In this case we have to ask the question ‘who benefits from hemp being illegal?’ The logical answer is: the oil companies- and their share holders, of course. Hemp became illegalized at the time when oil was beginning to make an impact on the economy as a base material for many things that hemp could also be used for, including textiles and fibres (plastics), cosmetics and fuel. Obviously, a resource is more profitable if access to it is restricted and not every farmer can grow it himself. In an exceedingly clever PR move psychoactive marijuana and hemp have been ‘thrown in the same pot’ as it were, and a massive campaign has been launched to convince people of the dangers of marijuana alias hemp – a highly questionable assertion. Although technically hemp is not illegal to grow in some states, it requires obtaining a special permit from the drug enforcement agency (DEA) to restrict mass production. These permits are rarely given out and require that the crop be surrounded by security measures such as fences, razor wire, security guards, or dogs. For a crop that has little-to-no potential to get people high, the current attitude is both irresponsible and draconian. Hemp is the most useful plant ally we have – a sustainable resource par excellence, as some might like to call it. Instead of cursing it we should be grateful to its deva and use all its ample gifts to turn the ecological demise of our planet around. It is not hard to see how immensely valuable hemp is and how it has the potential of solving many of our environmental problems, not to mention our health problems. Yet, we are continuously deprived of its benefits because farmers are prohibited from cultivating this crop. Obviously importing it or products made from it is very expensive and the high expense is a prohibitive factor to choosing hemp as an environmentally friendly alternative even where it is available. It makes no sense to import a crop like hemp, when it can be, should be and used to be grown in all temperate and hot regions of the world. Industrial hemp could transform the economy of the world States in a positive and beneficial way, and therefore should be exploited to its full potential.